If tailwind and the downhill course weren’t enough to get people rolling at the Pike’s Peek 10k in Rockville, five days of pent-up tension led to a moment of silence on the starting line to honor the victims and their families affected by the Boston Marathon bombing. [button-red url=”http://www.mcrrc.org/pikes-peek-10k-5″ target=”_self” position=”left”] Results [/button-red]Race director Jean Arthur said that Monday’s tragedy created anxiety for her with less than a week until the race. An impressive group made up the elite competition and led the way through some heavy wind conditions and a cool breeze. But runners seemed to enjoy the near-ideal running conditions downhill along the Rockville Pike to White Flint Mall. City to compete, pulled away from the leading pack near mile three. 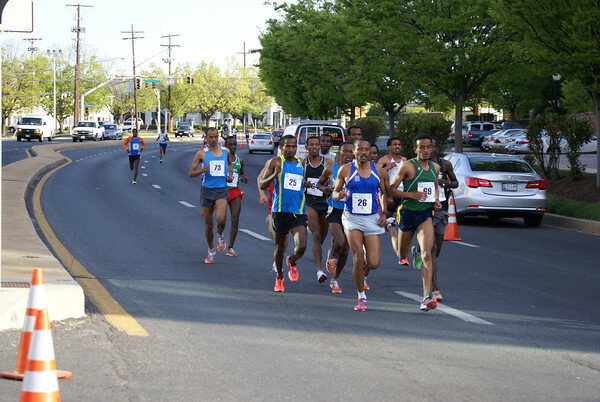 Less than a mile later, Gebre was able to widen the gap even farther and brought home a $1,000 check with a winning time of 28:23. Washington, D.C.’s very own Tumicha Horsa also had an impressive finish with a time of 28:45, placing third and winning $650. The women’s competition came down to Tsehay Getiso, a 19-year-old visiting from New York City for the race, and Jane Murage of Royersford, Pa. Both Getiso and Murage led the close-knit women’s pack for the majority of the race. Getiso, who recently overcame an injury, is currently working toward qualifying for the 2016 Olympics. And despite her best attempt to hang on, Murage took home the $1,000-winning prize money by crossing the finish line two seconds faster than Getiso. Trailing less than a minute behind the first two women was third-place finisher Hirut Mandefro of Washington, D.C. Mandefro brought home $650 with a fast finish of 33:13. The race’s additional security included K9 dogs at the start and finish and motorcycles that drove up and down the course. Though every year requires a strong police presence, which involves coordinating several large road closures, this year’s race implemented heightened security measures in the wake of recent events. Caroline Thompson of Rockville, Md., who has been running with a group of five other friends, said that she noticed some anxiety in the air. While the 18th Annual Pike’s Peek 10k marked Thompson’s second time competing in the race, she ran the course seven minutes faster than she did in 2012. Pike’s Peek marked Calvin Baxter’s first 10k race. A runner since 2001, Baxter of Silver Spring, Md. competed in a Superman t-shirt, the same shirt that his son wore for the Kids Fun Run. Though Baxter was a little nervous about competing in a race that he had signed up for only one day prior, he said he found himself wanting to pass people on the course. Tradition is important for Pike’s Peek, a race that celebrates finishing with a festival area full of food, family activities and live music. Thirteen years ago, Lieutenant Pedro Meneses competed beside his recruiting class when he was enrolled in the Montgomery County Fire and Rescue Training Academy. On the day of the Pike’s Peek 10k, Meneses led his own group of recruits to the race as head of the recruit fitness department for the Montgomery County Fire and Rescue Service, a tradition that he said has been going on for at least 13 years. Despite race security concerns throughout the country, the tradition and timeless racing spirit led to another successful Pike’s Peek. The event proceeds went to the Montgomery County Youth Recreation Fund, Rockville Youth Recreation Fund, Scleroderma Foundation of Greater Washington DC and the RRCA Road Scholars. GW Parkway Classic Provides Catharsis for many with Boston on their minds.